STRASBOURG, France (CNS) — The project of European unity and cooperation, ensuring peace on the continent and helping others find peace as well, requires a real commitment to dialogue and respect for others, Pope Francis said. 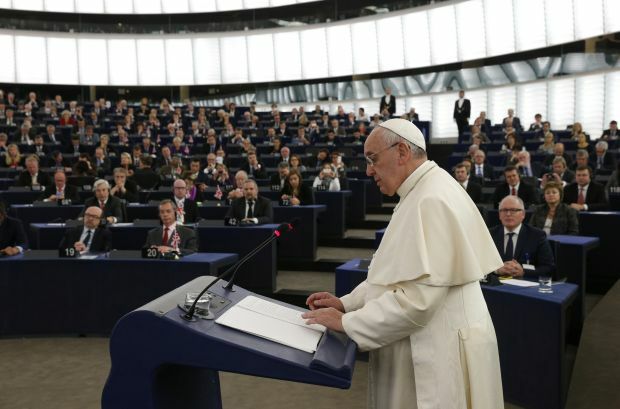 Visiting European institutions in Strasbourg Nov. 25, the pope marked the 65th anniversary of the 47-member Council of Europe, which was formed to promote democracy, human rights and the rule of law on the continent in the wake of the destruction and division sown by the World War II. Where is Europe’s energy, idealism and constant search for truth, he asked members of the Council of Europe’s parliamentary assembly, ambassadors from the 47 member states, the 47 judges of the European Court of Human Rights and other guests, including representatives of the religions present in member countries. “Europe should reflect on whether its immense human, artistic, technical, social, political, economic and religious patrimony is simply an artifact of the past or whether it is still capable of inspiring culture and displaying its treasures to mankind as a whole,” he said. “In a world more prone to make demands than to serve,” he said, helping one another and promoting a peaceful resolution of conflicts must be at the heart of the Council of Europe’s agenda. “The royal road to peace — and to avoiding a repetition of what occurred in the two world wars of the last century — is to see others not as enemies to be opposed, but as brothers and sisters to be embraced,” the pope said. Pope Francis told the Council of Europe, as he had told the European Parliament earlier in the day, he realizes members of the Catholic Church in Europe have not always been blameless, but that the church constantly commits itself to serving others better, a commitment that government and international organizations must make as well. He pleaded with the European institutions to be more serious and creative about increasing employment, particularly for the young. The high rate of unemployment among young people — averaging 20 percent across the 28 member countries of the European Union — is “a veritable mortgage on the future,” he said. The call to peace, Pope Francis said, first involves stopping violence, but it goes deeper and the Council of Europe project is to sow peace through the promotion and protection of human rights. Using the image of a tree — growing tall, but firmly rooted in the earth — the pope insisted that the European project cannot succeed if it does not maintain and nourish its roots of Judeo-Christian values, beginning with the sacredness of human life and the pursuit of truth and the common good. Without those roots, the pope said, people think only of themselves and their rights and needs, feeling free to “throw away” anything or anyone they do not find useful. “We have a surfeit of unnecessary things, but we no longer have the capacity to build authentic human relationships marked by truth and mutual respect,” the pope said. The lack of solid relationships has wounded Europe, sapping it of the vitality it once had and tempting it to close in on itself instead of helping others. European institutions and the continent’s citizens must stop speaking only to those they already agree with completely, he said. Dialogue with others actually strengthens one’s identity while also making one more sensitive to the gifts and needs of others.